We’d love your help. Let us know what’s wrong with this preview of The Power of Meaning by Emily Esfahani Smith. This wise, stirring book argues that the search for meaning can immeasurably deepen our lives and is far more fulfilling than the pursuit of personal happiness. There is a myth in our culture that the search for meaning is some esoteric pursuit that you have to travel to a distant monastery or page through dusty volumes to figure out life s great secret. The truth is, there This wise, stirring book argues that the search for meaning can immeasurably deepen our lives and is far more fulfilling than the pursuit of personal happiness. There is a myth in our culture that the search for meaning is some esoteric pursuit that you have to travel to a distant monastery or page through dusty volumes to figure out life s great secret. The truth is, there are untapped sources of meaning all around us right here, right now. Drawing on the latest research in positive psychology; on insights from George Eliot, Viktor Frankl, Aristotle, the Buddha, and other great minds; and on interviews with seekers of meaning, Emily Esfahani Smith lays out the four pillars upon which meaning rests. Belonging We all need to find our tribe and forge relationships in which we feel understood, recognized, and valued to know we matter to others. Purpose We all need a far-reaching goal that motivates us, serves as the organizing principle of our lives, and drives us to make a contribution to the world. Storytelling We are all storytellers, taking our disparate experiences and assembling them into a coherent narrative that allows us to make sense of ourselves and the world. Transcendence During a transcendent or mystical experience, we feel we have risen above the everyday world and are connected to something vast and meaningful. To bring those concepts to life, Smith visits a tight-knit fishing village on the Chesapeake Bay, stargazes in West Texas, attends a dinner where young people gather to share their experiences of untimely loss, and more. And she explores how we might begin to build a culture of meaning in our schools, our workplaces, and our communities. To ask other readers questions about The Power of Meaning, please sign up. The transcended chapter was slightly unclear to me. How does an atheist like me living a simple life find transcendence or identify with it. Will be great to have answers? This book provides a scattered collection of findings from population studies and various psychological and sociological studies related to human perceptions of meaning, fulfillment, happiness, and belongingness. These results of studies are intermingled with various examples of actions or training some people have used to move toward obtaining a sense of meaning in their lives. One point the book makes early on is that happiness and meaning are not the same thing. As a matter of fact it appears This book provides a scattered collection of findings from population studies and various psychological and sociological studies related to human perceptions of meaning, fulfillment, happiness, and belongingness. These results of studies are intermingled with various examples of actions or training some people have used to move toward obtaining a sense of meaning in their lives. One point the book makes early on is that happiness and meaning are not the same thing. As a matter of fact it appears that the two are inversely proportional to each other is some ways. This is pointed out in population studies by the relationship between reported rates of happiness and suicide. "Happy populations" have higher rates of suicide as pointed out by the following excerpt. People in wealthier regions, like Scandinavia, reported being happier than those in poorer ones, like sub-Saharan Africa. But when it came to meaning, it was a different story. Wealthy places like France and Hong Kong had some of the lowest levels of meaning, while the poor nations of Togo and Niger had among the highest, even though people living there were some of the unhappiest in the study. One of the most disturbing findings involved suicide rates. Wealthier nations, it turns out, had significantly higher suicide rates than poorer ones. For example, the suicide rate of Japan, where per-capita GDP was $34,000, was more than twice as high as that of Sierra Leone, where per-capita GDP was $400. This trend, on its face, didn’t seem to make sense. People in wealthier countries tend to be happier, and their living conditions are practically heavenly compared with places like Sierra Leone, which is racked by endemic disease, dire poverty, and the legacy of a devastating civil war. So what reason would they have to kill themselves? The strange relationship between happiness and suicide has been confirmed in other research, too. Happy countries like Denmark and Finland also have some high rates of suicide. Some social scientists believe that this is because it is particularly distressing to be unhappy in a country where so many others are happy—while others suggest that the happiness levels of these countries are being inflated because the unhappiest people are taking themselves out of the population. But Oishi and Diener’s study suggests another explanation. When they crunched the numbers, they discovered a striking trend: happiness and unhappiness did not predict suicide. The variable that did, they found, was meaning—or, more precisely, the lack of it. The countries with the lowest rates of meaning, like Japan, also had some of the highest suicide rates. OK, so the answer is meaning, but what is it and how can a person acquire it? The author asserts that there are "four pillars of meaning: belonging, purpose, storytelling, and transcendence." The book devotes a chapter to each of this "pillars" plus chapters on Growth, Cultures of Meaning, and Conclusion. I was particularly interested in the book's discussion of the variety of ways that people respond to trauma. Some children defy their disadvantaged environments while many others are victimized by it. Some adults come through trauma emotionally stronger while others succumb to PTSD. What's the difference? This book suggests that it's not necessarily the actual trauma that causes changes. It is how people interpret the trauma that matters. People who respond positively to trauma spend more time in "deliberate rumination," or introspection. They spend a lot of time trying to make sense of their painful experience, reflecting on how the event changed them. Doing so helped them make the life changes associate with "post-traumatic growth." One of the ways explored in this book to jump start this process of deliberate rumination is through writing about feelings related to the trauma. Another correlation noted by the book is that people who said they had experienced a major trauma in their childhood but had kept it a secret were significantly more likely to report health problems as adults than those who had spoken to others about the experience. Researchers have followed up by checking if people are encouraged to open up about trauma events, will it improve their health? Indeed, test results have confirmed this to be the case. It is suggested that the writing exercise made these improvements by, (1) Probing into the causes and consequences thus becoming wiser about it, (2) Their perspective changed from me to why the other party did what they did, and (3) They were able to find a positive meaning in their traumatic experience. Some of the characteristics of children who have shown the resilience to overcome childhood trauma include purpose (often shown as feelings of altruism), social support, transcendent sources of meaning, and genetic predisposition. Fortunately, researchers have demonstrated that characteristics of resilience can be taught to those without the genetic predisposition. This is one of those books that can change the way you look at life and change your life if you let it. Ever wonder why some of the richest/first world countries are rated the "happiest" countries but have the highest suicide rates as compared to some of the poorest/third world countries? Meaning. People in poorer countries see their lives as more meaningful even if they have to work harder and suffer more. Having focus on other people versus yourself (like in individualistic -centered societies This is one of those books that can change the way you look at life and change your life if you let it. Ever wonder why some of the richest/first world countries are rated the "happiest" countries but have the highest suicide rates as compared to some of the poorest/third world countries? Meaning. People in poorer countries see their lives as more meaningful even if they have to work harder and suffer more. Having focus on other people versus yourself (like in individualistic -centered societies) has made people feel like their lives are more meaningful. Just because your life is easier and you do not have to worry about day to day survival doesn't always mean you see a purpose or meaning to life. There are studies and research throughout this book as well as stories to illustrate the point of having a meaningful life versus a happy life. It gives you ideas and inspires you to make your life more meaningful as well. This book took me a long time to read for such a short book but I was constantly looking things up or just thinking about what I read that I felt that it was well worth the read. I will definitely be rereading this book for ideas and inspiration. I received this book from LibraryThing through their Early Reviewers program with the understanding that the content of my review would not affect my likelihood of receiving books through the program in the future. Many thanks to Crown Publishers, Emily Esfahani Smith, and LibraryThing! Not bad, but unnecessary. The best parts are book reports of better stuff. Much of the rest is composed of anecdotes and descriptions of small psych experiments. A common theme throughout is people hitting bottom (jail, end of life, drugs, etc.) and then deciding to maybe look for a different path. For people who aren't already at bottom, this isn't a very productive roadmap. The "scien Not bad, but unnecessary. The best parts are book reports of better stuff. Much of the rest is composed of anecdotes and descriptions of small psych experiments. A common theme throughout is people hitting bottom (jail, end of life, drugs, etc.) and then deciding to maybe look for a different path. For people who aren't already at bottom, this isn't a very productive roadmap. People are often in search of happiness, but Emily Esfahani Smith argues that people would do well to search for meaning instead. Smith looks closely at the research that has been done on four areas of finding meaning: relationships to others, contributing to society, making sense of experiences, and connecting to something bigger than one's self. The book is, happily, both readable and based on research, and that doesn't often happen. This was amazing, brilliant, and totally the perfect book at the perfect time. I will be passing this on to everyone in existence and reading it myself often. In Learned Optimism: How to Change Your Mind and Your Life, Martin Seligman recalls visiting his father in a nursing home and witnessing his father’s despair after being disabled by a series of strokes. Then as a student and later a professor of psychology, Seligman saw helplessness again and again, in lab animals that had been inadvertently conditioned not to attempt control over their environment, and in depressed people who reported feeling empty. Seligman went on to prove that it was possib In Learned Optimism: How to Change Your Mind and Your Life, Martin Seligman recalls visiting his father in a nursing home and witnessing his father’s despair after being disabled by a series of strokes. Then as a student and later a professor of psychology, Seligman saw helplessness again and again, in lab animals that had been inadvertently conditioned not to attempt control over their environment, and in depressed people who reported feeling empty. Seligman went on to prove that it was possible to lift people out of despair by changing their beliefs about their circumstances; you can teach optimism and resilience. Seligman’s work helped divert psychology from cataloging mental aberrations and toward the study of psychological strengths, and positive psychology was born. While Learned Optimism is an illuminating look at the founding of positive psychology, it’s not the best introduction to the field for laymen, as it alternates between verbatim schema from Seligman’s research and anecdotes about his children and ex-wife. Emily Esfahani Smith gives a much more accessible overview of positive psychology in The Power of Meaning: Crafting a Life That Matters. With generous hand-holding, Smith describes studies on the importance of community, transcendent experiences, and other “pillars of meaning” for psychological well-being. Smith has interviewed many people who have found some kind of purpose or meaning in life, and some of the stories of overcoming adversity begin to blur together. A few stand out, such as that of a man who was imprisoned for dealing drugs, got in a fight, and ended up in solitary confinement. He was given a pen, an envelope, paper, and a Bible. He wrote a letter to his family, but without a stamp, he was unable to send it. Then he received a letter from his sister recommending that he read Psalm 91. When he opened the Bible to that psalm, he found a stamp between its pages. He was able to mail his letter, and after he was released, he opened a personal training business based on a fitness program he had invented in prison. Also moving is a story from Smith’s own life. In the introduction, Smith explains that she grew up in a Sufi meetinghouse. She writes nostalgically of the devotion of the darvishes, who often traveled great distances to come to her house and meet a visiting mystic. Every act of the Sufis’ religious practice was imbued with meaning, and Smith would try to imitate their manner of drinking tea and meditating. But when Smith was a teenager, her family “drifted away” from Sufism and left her searching for another source of meaning to replace it. Smith assures us that the precepts of positive psychology are an ample substitute for her lost childhood faith, but it’s hard to believe her. That’s not to say that the research isn’t valuable. Some of the studies she cites are genuinely clever or instructive, such as one that induced awe in an experimental group by positioning the subjects beneath a large replica of a dinosaur skeleton, and another that tracked the effects of a purposeful job description on fundraisers at a university call center. After they learned how their work was helping a scholarship recipient, the fundraisers spent more time on the phone and raised more money than their coworkers in a control group. What’s unconvincing about the idea of a meaningful-but-not-religious life based on Smith’s four pillars is that the advice presented here has no encompassing narrative, despite the fact that one of the pillars is storytelling. Each of the studies that Smith writes about examines an isolated aspect of a meaningful life, and the examples often feature adherents of religions or philosophies. But since psychologists are not concerned with choosing between cultures, their recommendations can be applied to any beliefs and are kind of vacuous in the aggregate. It appears that Buddha, existentialism, and a jousting club all have equal claims to creating meaning, as long as they can clear a few easy hurdles like forming a community and motivating people to act. Choosing from the available meaning sources for the purpose of maintaining psychological health is not a very significant choice, then, since any other option could have been just as therapeutic. This could be even more of a problem for the people who sample the suggested meaningful activities without settling on a belief system at all. Chasing after meaning through incidental attendance at stargazing night or StoryCorps could prove just as unsatisfying as chasing after happiness, which Smith rightly concludes is a way to disappointment. The absence of a frame of reference also means that there is little acknowledgement that meaning sources can conflict with each other. In Smith’s telling, meaning is almost always good. Only in the final chapter does Smith briefly mention that people can find meaning in evil, as for example recruits find meaning in ISIS. It’s clear from just a passing reference to ISIS that meaning is not sufficient for either individual or societal well-being and that meaning sources must be measured against other values. But Smith doesn’t explore what those values might be and merely trusts readers to pursue meaning virtuously. The Power of Meaning has some sensible suggestions for people who want to do something fulfilling: be involved in a community, find a purpose, and seek transcendence. The advice will be much easier to follow if you already have a philosophy or faith in which to carry it out. It probably won’t teach anyone to craft a meaningful life from scratch, although it may give you some ideas for adding meaning on the margins. Paths to meaning cannot run directly through happiness. Paradoxically, chasing happiness actually makes people unhappy. Unearned happiness does not bring us joy. A chief research finding is that there is a distinction between a happy life and a meaningful life. While hedonism refers to happiness, Aristotle used the ancient Greek word eudaimonia to refer to “human flourishing.” “Leading a eudaimonic life, Aristotle argued, requires cultivating the best qualities with you both morally and intellectually and living up to your potential.” If hedonia is defined by feeling good, then researchers argue that eudaimonia is defined by being and doing good. In searching for the essential elements of meaning, Smith studied Sufi rituals, the work of several philosophers, great literature, positive psychology, student interviews, mythology, Life magazine, and other sources. Four themes presented themselves again and again throughout her search. She identifies these four pillars of meaning as: belonging, purpose, storytelling, and transcendence. Each chapter dedicated to exploring one of these pillars brings the ideas to life through the experiences of real people. Storytelling—the third pillar of meaning— “is fundamental to the human search for meaning, whether we tell tales of the creation of the earth or our own early choices.” Storytelling helps us understand our lives as coherent. When crafting our stories we have the chance to focus on the most extraordinary events of our lives, both good and bad. People who believe their lives are meaningful tend to tell stories defined by growth, communion, and agency. Our stories endow mere facts with meaning. In the final chapters, Smith draws on her background in positive psychology to explore how these pillars of meaning can help up is overcome adversity, grow through resilience, and create cultures of meaning. Pleasant stories and rigorous research meld into this readable and authoritative treatment of an important and timely topic. The Power of Meaning makes the reader stop and question what is the meaning of your life. What gives it purpose, why are you here. I'm a cancer survivor and this book brought back memories for me of when I was going through treatment and asking myself why me. What is the meaning for me to go through this scary time. I found my purpose was to tell my story about surviving cancer to whoever wanted to listen so that maybe I can help ease any doubts and worries they might have when they are faced wi The Power of Meaning makes the reader stop and question what is the meaning of your life. What gives it purpose, why are you here. I'm a cancer survivor and this book brought back memories for me of when I was going through treatment and asking myself why me. What is the meaning for me to go through this scary time. I found my purpose was to tell my story about surviving cancer to whoever wanted to listen so that maybe I can help ease any doubts and worries they might have when they are faced with cancer treatment. I have talked with several friends and friends of friends to share my knowledge. This was a wonderful book that reminded me of what the meaning of my life is about. Now I hope to make a difference in someone's life through my writing and sharing my love of books with my neighbors through my Little Free Library. This is a reminder that the meaning of your life doesn't have to be grand, it can be something small that makes you happy and makes you want to live. There is a subtle difference between the question “What is the meaning of life?” and “What is the meaning of my life?” The latter of which has caused me great anguish in recent years. While this book didn’t give me a solution, it did give me tools to help find the answer. Up until the 18th century, students looked to religion for a greater purpose in life, but then teachers started using philosophy and classic literature to convey meaning. By the 20th century, professors decided that meaning was There is a subtle difference between the question “What is the meaning of life?” and “What is the meaning of my life?” The latter of which has caused me great anguish in recent years. While this book didn’t give me a solution, it did give me tools to help find the answer. Up until the 18th century, students looked to religion for a greater purpose in life, but then teachers started using philosophy and classic literature to convey meaning. By the 20th century, professors decided that meaning was simply too abstract to teach, that school was for objective learning, and Positive Psychology aimed to help people understand what makes life fulfilling. The interest in happiness has tripled since the mid-2000s, but the sad irony is that chasing happiness has a way of making you more miserable. Meaning and happiness can be at odds. Having children, for instance, is often considered one of the greatest sources of meaning—but those who do report lower levels of happiness. So how do we create meaning in our lives? Having strong social connections with others is important, as is contributing to society in a meaningful way. Smith provides many examples of how others have achieved this, ranging from helping people get in shape, to helping save lives. Their stories are incredibly moving and reminded me that while my job could be a million times more stressful, I’m also doing something which I believe is a meaningful contribution to society: I’m helping people buy more books, which I sincerely hope will enrich their lives. That being said, I know that I still want to accomplish so much more, and I now understand why. This book hit me at just the right time and helped reaffirm the belief that life should be fulfilling, that it’s not selfish to strive for meaning, and that in doing so, you can bring meaning into the lives of others. This was fine, just lighter and fluffier than I was expecting. This is one of my new favorite books. I've read a lot of psychology/business/self-help books over the years, and usually I walk away with a better understanding and a new framework that is helpful. Usually the frameworks are small evaluations of how I speak with others, how I view leadership, or how to delegate. The Power of Meaning had me evaluating my life plans and trajectory by continually asking myself, "What is the good hard thing that I can do now that will have me look back on life with This is one of my new favorite books. I've read a lot of psychology/business/self-help books over the years, and usually I walk away with a better understanding and a new framework that is helpful. Usually the frameworks are small evaluations of how I speak with others, how I view leadership, or how to delegate. The Power of Meaning had me evaluating my life plans and trajectory by continually asking myself, "What is the good hard thing that I can do now that will have me look back on life with more satisfaction in the future," and then planning from there. Rare is the book that challenges me to reevaluate my being and the meaning behind what I have to offer the world. I appreciated the stories and the break down of the book. I found myself pausing regularly to think about things like, "If I care so much for the orphans in this story that I'm reading about, then what am I going to do to help children in similar situations?" or "If I find meaning in fatherhood, what am I doing to make my son a priority to not only teach him but listen to and learn from him?" This book helped me reevaluate portions of my life and has started me on a path of reorganizing my goals and prioritizing them differently. I think the thing this book did for me that helped me the most was reevaluate my relationship with God and my understanding of death. As a child I had a child's faith in God. I believed in Him, but so much of that belief was based out of obedience. As I grew up, that obedience shifted to fear of offending God, and my relationship with God was believing that He was an easily perturbed taskmaster bent on justice. As I got older, my view shifted. I couldn't believe in a vengeful God. I turned to the scriptures and found verses that instead focused on love, empathy, and compassion. I felt like I better understood the story of Jesus, and I felt more comfortable with the God of Matthew 7:11, a God who was waiting to bless us and is full of understanding. But while I grew more comfortable with this concept of God, a lingering thought always popped up in the back of my mind, "You're comfortable with this concept of God, because that's what God is, a concept." Over the last few years, that thought has made it's way to the forefront of my mind. Maybe I misunderstood God because God is nothing more than our current interpretation of Him. And if that's true, then religion is false. And if religion is false, then one day we die, we disappear, and that's all there was. And quite frankly, that scares the hell out of me. So I've seen my faith shift to desperation. I want God to be real because the alternative is terrifying. Either God is real or else I'm living just to die and there's no meaning to life at all. To make a poor analogy, God became a parachute that I was promised that I'm hoping appears when I pull the cord, but I'm also suspicious He's not there because sometimes the pack feels pretty light. And that's how I've lived with my faith these last few years. A desperate plea that God is real rather than a feeling that He is. And it's that fear that stunts my spiritual growth, but until this book, I hadn't seen many ways around it. What this book has started to do for me, is show me an alternative narrative. And it might be a strange narrative, but it works for me, and that narrative started with a question: If God isn't real, and this life is all we have, then what am I? I believe that that answer is then simply star dust. I'm a bunch of atoms and molecules whirring around in what I recognize as a body, but the amazing miracle is that this specific group of atoms identifies itself as a whole, and has a consciousness to momentarily recognize itself as an entity. And if that's all there is, if that's all this conscious life is about, then what a privilege it is to even momentarily experience life this way. There are atoms and molecules floating around that do not seem to have the same level of consciousness as humans. It's a miracle that all of me has been placed together in such a way that I have consciousness. If God isn't real, then one day I will die, those atoms will dissolve into the ground, become reabsorbed by the earth, and change into the grass, or dirt, or hydrogen and nitrogen or whatever. Life will continue, I will in a way continue, consciousness will not. And what a privilege it was to be organized in this way for however long I get. This shift in focus from inevitability of death and meaningless to one of gratitude for being able to even experience life in this way, I believe opens up a new channel for me to relate to God. A relationship based out of desperation and fear of an alternative is no relationship at all. That view has stripped me of my feelings of agency in choosing God and replaces those feelings with an inevitability of choosing God or meaninglessness. It's my belief that my re-framing of the potential purposes of life invites me to explore new reasons to relate to and hold a relationship with God. If I can no longer choose Him based on fear, why will I choose Him? I'm excited to better explore those emotions and choices, and I think it invites my life outlook on God and the alternatives as being one filled with gratitude instead of fear. I'm excited to have an improved relationship with my Heavenly Father. Summary: Explores the importance of meaning in one's life, four pillars upon which meaning rests, and how we might cultivate cultures of meaning. The question of what a life well-lived is one that philosophers and baristas, young and old alike have considered from the earliest records we have of human musings. Emily Esfahani Smith introduces us to the importance of this in describing the beauty of the Sufi community gatherings in which she grew up and the findings of positive psychologists Martin Summary: Explores the importance of meaning in one's life, four pillars upon which meaning rests, and how we might cultivate cultures of meaning. The question of what a life well-lived is one that philosophers and baristas, young and old alike have considered from the earliest records we have of human musings. Emily Esfahani Smith introduces us to the importance of this in describing the beauty of the Sufi community gatherings in which she grew up and the findings of positive psychologists Martin Seligman and Robert Nozick. At one time, it was at the heart of university education and considering the great ideas was to consider how people through history found meaning. No longer. And yet now as ever, people face a crisis of meaning as they try to answer the question of what they are living for. Smith does not offer a single answer, recognizing that people have answered this in numerous ways in different religions, philosophies, or ways of living. What she does instead is draw upon contemporary research and a wide range of writers and extra-ordinary people who have grappled with questions of meaning to identify four pillars or necessary elements upon which a meaningful live is built or as she puts it, "crafted." Belonging. She writes of the close knit community of the Tangier Island watermen and the Society for Creative Anachronism as two examples of communities that foster a high sense of belonging and thus meaning for their participants. From infants to old people, isolation is deadly to health and one's sense of well-being. Purpose. We meet a young zoo-keeper and an ex-con who launched a fitness enterprise after helping first himself and other prisoners get fit. And she gives the example of the NASA janitor who told President Kennedy that it was his purpose to "help put a man on the moon." Whoever we are, we need some big goal around which we organize our lives. Storytelling. This caught me by surprise at first. Yet we all need to be able to see the course of our lives as a coherent narrative that makes sense of the world. She tells the stories of The Moth and the Story Corp projects and how significant the telling of stories are for both storytellers and their audiences. Transcendence. She describes the "Overview Effect," the experience of astronauts having scene the planet as a whole and not being able to ever approach life the same way again. For many, transcendence comes through some form of religious experience, but whatever it is, it is this sense of being part of something vastly greater than oneself. Her concluding two chapters are on "Growth" and "Cultures of Meaning." She writes of how often the discovery of meaning comes through adversity, using the examples of the Dinner Party, a gathering for those who have lost loved ones who are trying to find meaning in the midst of their grief, and Dryhootch, a coffee house for veterans suffering from PTSD founded by a vet whose struggles with PTSD led to a drunk driving accident where he killed another man. In "Cultures of Meaning" Smith describes how people have found meaning in communities emphasizing each of the pillars, ranging from a church to an apparel company. Emily Esfahani Smith's approach, as you may be able to tell is to mix a bit of research, insights from thoughtful writers like Viktor Frankl, and real life stories. It makes for a highly readable account. She honors both those whose sources of meaning are found in religious faith, and those for whom it is not. While some who are committed to a particular way of defining meaning might find this to "relativistic," I would contend it is a great way to discover the ways people find meaning besides one's own way. I could see the book being used for discussions where the object is learning about how others find meaning by exploring where each of us finds belonging, what gives each of us purpose, how each of us would narrate the story of our lives, and where we have experienced transcendence. It raises good questions, particularly for those in religious traditions, about how one might go deeper in those traditions. We may embrace certain formal beliefs and practices, yet for our faith to be something alive both for us and others, the elements of belonging, purpose, story, and transcendence are indeed essential to living out lives that matter. To whom we belong and who we love, how we translate what we believe about God or whatever Ultimate we affirm into purposeful action, how we make sense of our story as part of a larger Story, and how we cultivate an attentiveness to God or the Ultimate are the things that bring beliefs to life. Ultimately, the "four pillars" must rest on some foundation and not thin air, but a foundation alone does not make a house to live in, but only something on which to build the meaningful life. This book may help us reflect on how well we are building. Emily starts with an effective, deep philosophical review of human meaning, because this important topic has been considered for millennia. Just only this beginning, alone, makes the book highly valuable. I will return to re-read this from decade to decade. Meaning indeed comes from: belonging, purpose, storytelling, and transcendence. Per additional chapters on culture and growth are also valuable. Her powerful conclusion poles in the master, Victor Frankel, and amazes me as she both validates h Emily starts with an effective, deep philosophical review of human meaning, because this important topic has been considered for millennia. Just only this beginning, alone, makes the book highly valuable. I will return to re-read this from decade to decade. Meaning indeed comes from: belonging, purpose, storytelling, and transcendence. Per additional chapters on culture and growth are also valuable. Her powerful conclusion poles in the master, Victor Frankel, and amazes me as she both validates him in a way that he was too humble to do for himself, while adding to his unforgettable contribution. It is the conundrum that has haunted us from the beginning of time: What is the meaning of life? To Emily—her writing and personality seem to invite familiarity—it all turns on the four pillars of meaning: belonging, purpose, storytelling, and transcendence. Emily gave a TED talk in April, 2017, entitled, “There is more to life than being happy,” and if you haven’t watched it, I highly recommend it. It is insightful, concise, engaging, and delivered with humility and authenticity. My first though It is the conundrum that has haunted us from the beginning of time: What is the meaning of life? To Emily—her writing and personality seem to invite familiarity—it all turns on the four pillars of meaning: belonging, purpose, storytelling, and transcendence. Emily gave a TED talk in April, 2017, entitled, “There is more to life than being happy,” and if you haven’t watched it, I highly recommend it. It is insightful, concise, engaging, and delivered with humility and authenticity. My first thought upon watching it was that we should all have a cup of coffee with this woman. People will be naturally inclined to compare the book and the talk, and many reviewers have. That’s certainly understandable, in part due to the high quality of the talk, but perhaps a bit unfair. It is far easier to explain a concept that is already positively perceived, like belonging and purpose, in summary than in detail. Since we ultimately want to believe, the explanations can seem less inspiring than the summary itself. The author tells her story through stories. And some have noted that the stories sometimes seem disconnected or less than fully relevant. And they are, in many cases, not run-of-the-mill. A Compline religious service, or a Sufi meetinghouse, for example, are not things most of us will ever experience. This sense of irrelevance, however, is more due to the story of the book rather than the stories themselves. The meaning of life is an ambitious topic to take on. Different parts of the book will resonate more or less with different readers. The sections on storytelling resonated with me. I’ve always been struck by the observation that good storytellers not only make good authors; they seem to be more grounded than the rest of us. One might conclude that this is a function of the skills of storytelling, but I think that’s too simple an explanation, and Emily has reinforced my thinking. We all have a narrative. If we can’t tell it without jumping around like beads of water on a hot skillet, it probably has less to do with our ability to tell stories than the perspective we bring to the story. Every narrative is compelling when perceived in the right way, although far from all are redemptive. The concept that I struggle with most is belonging. It suggests a need to externalize that I find uncomfortable. For starters, I do believe there are a large and growing number of us who will never externalize, whether we seek to or not, yet each of us has a great deal to offer. Are we destined to live lives without meaning? Secondly, I believe my life does have meaning, despite the fact that I belong to no group even remotely similar to the Society for Creative Anachronism, the group of medieval enthusiasts and re-creationists this is the subject of one of her stories. This lack of interest in joining any club I attribute, in the utmost positive way, to my Chinese wife. We live our lives isolated from the world but far from alone. We have each other in the most basic sense. To say we share a soul seems demeaning and cliché. We share more than that. Were someone to find us months after our passing alone in our townhouse, there would be no need for sorrow. We would have died very content. Probably not in each other’s arms; perhaps not even happy in the sense that word is commonly used; but each with belonging in our hearts. Emily is a philosopher, psychologist, scientist, and a person who was taught a highly spiritual perspective from an early age. That may mean that her language and perspective seem a little scattered to anyone who is strongly associated with only one or two of these perspectives. I think, however, that this diversity in thought and perspective makes her uniquely qualified to write this book. Anyone who has ever tried to thoughtfully meditate in the Buddhist tradition (I have not, but I have spent a lot of time over the last six decades contemplating the void, as I refer to it.) will know that is not easy. An inspiring book that will make you reconsider what life is about Thanks to NetGalley and to Penguin Random House UK, Ebury Publishing for providing me with an ARC copy of this book that I voluntarily chose to read and review. I don’t read many inspirational books so I cannot share a deep analysis of how original the book might be or where it sits in regards to the topic. The book covers a variety of subjects, and it is classed under psychology and health, philosophy and self-help, and I agree i An inspiring book that will make you reconsider what life is about Thanks to NetGalley and to Penguin Random House UK, Ebury Publishing for providing me with an ARC copy of this book that I voluntarily chose to read and review. I don’t read many inspirational books so I cannot share a deep analysis of how original the book might be or where it sits in regards to the topic. The book covers a variety of subjects, and it is classed under psychology and health, philosophy and self-help, and I agree it does touch on all those. I’m a psychiatrist and I must admit I have never studied Positive Psychology as part of my degree but this book doesn’t require an in-depth knowledge of any of the disciplines to benefit from it. The author opens the book by introducing herself, her background, and questioning the current focus on happiness. Is happiness sufficient to lead a satisfying life? She goes on to discuss many of the studies that show that having a sense of meaning can make a big difference to the outcomes of people at a time of crisis, be it a life-threatening illness or students going through exams, and grounds the readers in the subject. She uses one of the pillars she identifies as important to creating meaning, story-telling, to hook the readers into the topic of the book. If somebody came to you and asked you to give him (her) a reason not to kill him/herself, what would you say? That’s what happened to Will Durant and what set him off asking his colleagues and trying to understand what brings meaning to people’s lives. From there, and using positive psychology, Emily Esfahani Smith, defines the four pillars that bring meaning to people’s lives: belonging, purpose, story-telling and transcendence. The author illustrates each one of these topics with individual stories that help make the points more accessible. We have a young man who was only interested in money, became a drug dealer, and when he went to prison discovered his lifestyle was literally killing him. There he changed his habits and ended up not only becoming fit but also helping others to become healthier. We have a woman who loves animals and finds her purpose in looking after the animals in the zoo, ensuring their lives can be interesting there too. I learned about dream directors who help young people find purpose and meaning; I read about projects that help people in the final stages of life to find a purpose, other projects that help individuals tell their stories and record their experiences, groups that bring people who’ve lost somebody together… The author achieves this and more, all the while providing sources for her findings and reminders of how the issues discussed relate to philosophers and historical figures past and current. We might discover belonging by joining a society that enacts battles or find transcendence walking in nature or attending a special service at church. Ultimately, this is not a prescriptive book, and the process of discovery of meaning is an individual one. I loved the stories, which go from individual experiences to projects that have grown and become important to many people, and the theoretical reflections that underpin the concepts, which are clearly explained and will also encourage readers new to the topic to explore further. The author succeeds in preserving the unique voices of the people whose experiences she shares and her own writing is seamlessly and beautifully achieved. The book made me think and rethink life and its priorities and I suspect it will have a similar effect on many people. A book on an important topic, written in an easily-accessible manner, illuminating and inspiring. Although I read it quickly for the review, this is a book that can be savoured and returned to as needed, and it will provide new discoveries and insights with every new reading. A final note: Although the book appears quite long, the notes at the end occupy a 33% of the e-book (although they are easily accessible) and it does not feel like a long read. I loved this book. A neighbor was talking about it and it intrigued me enough that I picked it up the next day. The focus on meaning appealed to me because I have always felt that the pursuit of happiness wasn't for me because simply chasing "happy" sounds like a life of frivolousness and ignoring the dark side which seemed an incredible priviledge and selfish (to me, anyway, a former friend and I have had many an argument about this). But to chase meaning, to find purpose, that was what I wante I loved this book. A neighbor was talking about it and it intrigued me enough that I picked it up the next day. The focus on meaning appealed to me because I have always felt that the pursuit of happiness wasn't for me because simply chasing "happy" sounds like a life of frivolousness and ignoring the dark side which seemed an incredible priviledge and selfish (to me, anyway, a former friend and I have had many an argument about this). But to chase meaning, to find purpose, that was what I wanted and in that of course, there would be reward and joy, and this solidified that. The psychology behind how we frame what happens to us, what we do with our lives, how we see our work, and how we connect with other people to find purpose and meaning resonated with me. People with a higher sense of meaning thrive in every way even though they may have harder circumstances or deal with more difficult things because they are putting themselves into brutal situations to try to be of help. However, even things as simple as seeing the bigger picture at your job (to use an example: a bricklayer was asked what we was doing and he said, "laying bricks on top of each other" and another was asked the same question and answered "creating a beautiful place for a family to live and be comfortable in" ) can make all of the difference. The author also discussed how important a sense of belonging is to our feeling of meaning in our lives and how that's missing in so much of society today. I could very much relate to that as I have many times in my life felt I didn't 'belong' wherever I was and even though I don't need to be with people 24/7 (and frankly don't want to) , there is a deep sense of comfort and security in feeling you have tribe, your sense of a place in this world. This is actually what made some 3rd world countries higher on the "Happiness" scale than the USA, that people felt a sense of belonging and purpose in their communities. The chapter that intrigued me the most was the one on transcendence because I have always been captivated by mystical experiences, that sense of reverence when hiking in the mountains or swimming in the lake or just being still and feeling that hum from nature. I'm not ready to do LSD to repeat it like the experiment in the book but it definitely reinforced that I need to get into nature more. This book will save you from browsing journals, researching, or listening to complicated philosophical discussions in your attempt to figure out how best to accomplish a meaningful lifestyle. Smith writes concisely, delivering a wide array of research from the field of science, philosophy and ethics -Kant, Aristotle, Viktar Frankl- and psychology and also religious perspectives - Sufism, Ghandi, the Buddha. As someone who studied Psychology and religion, I appreciated Smith's thorough exploration of topics including grief, legacy, death, suffering and ultimately, love and compassion. Also having studied William James and religious experiences, I already had an interest in mysticism and the meaningful lives that result from such experiences. I found Smith's research to be impressive, and the lessons drawn from said research were easily understood. Though this is evidently a scholarly piece of work, you do not need to be a scholar to understand it as the language and terminology was defined. In the Western world, we live such busy, distracted, lives. We often blindly obey, believing our choices to be made for us, or we just follow everyone else. We conform. Thus, we don't always get the chance to appreciate the questions which demand deep thought or we deliberately avoid such questions. This book takes you on that personal journey, guiding you and helping you answer the questions that so often lie dormant at the back of your mind. Sometimes the book you need finds you! This profound, well-written, and beautifully inspiring book surely offers something for everyone. It is, for lack of a better phrase, life-changing. I received a copy free from the publisher through Goodreads Firstreads. In her book, The Power of Meaning, Emily Esfahani Smith, writes about the Sufi “path of love.” “To Sufis,” she says, “loving and adoring God means loving and adoring all of creation and every human being that is a part of it.” This is such a beautiful concept and way to live out one’s life. It is certainly one that I have adopted in my own daily practice as I am out and about. In my faith tradition, Christmas is the time that reminds us that the Incarnation reveals the sacredness of the infinite and the finite. We forget that those around us and whom we encounter each day is a reflection of God. My interactions with others, if truly shaped by this, make them not transactional, but transformational. I see the worth and value of each life and am awed by how they are unique: shaped and molded by the histories of all who came before them and of the paths it took for their very births to occur. It is astounding when one stops to even consider the factors and events that led to this very moment in life. How many of us take the time to do that beyond social media? As we hurriedly finish up our holiday shopping to cross that last name off the list, do we stop, even for a brief moment, to connect with another person in that store? Someone we have never met or spoken to before? Do we say a kind word or let them go in front of us in line for no other reason than to offer a simple gesture of generosity? Do we offer others the gift of peace, joy, hope and love by telling a cashier or an employee who looks weary and worn down by this season, “I just want to thank you for the work that you do.” So often, when I’m in stores, I most often hear customers barking and angry at these associates because the store doesn’t have whatever the hot toy of the moment is. “My kid’s Christmas is ruined,” they declare. And I cannot help but think, “Then there is something wrong with how you have raised your child.” If we are raising children who can only be happy with stuff, then we have instilled the wrong values into them. We have not raised them to be creators but consumers. How many have connected the idea of meaning to what one acquires instead of what one is inspired by? In my own life, I have learned that I would rather have experiences than presents. The Trappist monk, Thomas Merton, wrote, “We do not find the meaning of life by ourselves alone – we find it with another.” Meaning is not found in isolation but in being lived out in community, in living and learning and working with others. Sometimes it is found in simply stopping to listen to someone else who clearly needs another person to hear them and acknowledge whatever they are going through. This season can be particularly hard for those who are suffering any type of loss or loneliness. I have listened to a cashier share her sadness over the tragic death of her child to cancer. Of the employee whose family no longer has anything to do with them since they came out. Or to the elderly greeter whose children aren’t coming this year. I stop and I listen and I empathize and I offer them my attention, without distraction, or the desire to hurriedly move on with my life. When I am present to another, I am once again reminded of the connection that truly does bind all of us together. The Greek philosopher Aristotle coined a term eudaimonia. This means “human flourishing.” What I like is that it as an act of “being and doing good.” Do we not need more eudaimonia in this world. Where we don’t concern ourselves with whether or not another person shares the same political or religious views that we do, but only that as another human, we are, in this moment, sharing the same space. After the Apollo 8 shared a photo of the Earth from space, the poet Archibald MacLeish wrote in the New York Times, “To see the earth as it truly is, small and blue and beautiful in that eternal silence where it floats, is to see ourselves as riders on the earth together, brothers on the bright loveliness in the eternal cold – brothers who know now they are truly brothers.” If only we could continue to see ourselves in this light, to know and live out this realization that we are truly brothers and sisters. In The Power of Meaning, Emily Esfahani Smith writes of the four pillars of meaning: belonging, purpose, storytelling, and transcendence. These are all connected. A storyteller telling you a story is like receiving a gift. There is something so rich and nourishing about being told a story. That is why children so love to be read to or told a story by their parents. I remember when I was a boy and we would go to my mother’s side of the family for holidays and I loved listening to my elders tell stories of Christmases past and of relatives and ancestors I never knew. I felt connected to those who were telling the stories and those who were the story. Being told these stories was the greatest gift they could have ever given me and they are the ones I cherish most in my own life as I pass them on, as all great gifts are meant not to be kept but to be shared, to my own children. Edith Sitwell, the British poet, remarked, “Winter is the time for comfort, for good food and warmth, for the touch of a friendly hand and for a talk beside the fire: it is the time for home.” May we remember this as we approach the holidays. May we each find joy, comfort, peace, and love not in the packages we unwrap but in the people we open ourselves up to and allow them the space to open themselves up to us. More than 3.5, not quite a 4. Smith's breakdown of four pillars of meaning made sense to me - belonging, purpose, storytelling, and transcendence. The chapters on each are a good mix of inspiring stories and hard science (the endnotes are very thorough). The content also lines up well with Buddhism / meditation-based books I read. Not life-changing, but definitely excellent food for thought. This book was excellent. So much so that I bought my own copy. It is a wonderful look into the study of meaning and how we can implement it into our lives as well as how others have done so. It was well researched and fun to read. Very aplicable to yourself and others if you are in a helping profession. I highly recommend it. What is the meaning of life? Why am I here? These are questions that have taunted mankind since the beginning of time. THE POWER OF MEANING provides a straightforward and inspiring answer, based on extensive research and analysis. Simply put, the meaning of life is to find meaning in life. And it’s actually easier to find than we are often led to believe. “The search for meaning is not a solitary philosophical quest, as it’s often depicted,” writes the author. “… and meaning is not something we c What is the meaning of life? Why am I here? These are questions that have taunted mankind since the beginning of time. THE POWER OF MEANING provides a straightforward and inspiring answer, based on extensive research and analysis. Simply put, the meaning of life is to find meaning in life. And it’s actually easier to find than we are often led to believe. There is so much to this book, it’s hard to boil it down in a review. (I found myself rereading and marking lines on page after page, and I handwrote six pages of notes upon completing it.) By summarizing dozens of psychological studies, presenting scores of anecdotes and stories about real people, and sharing many of her own thoughts and insights on the differences between happiness and meaning, Smith ultimately brings the reader to the simplest of revelations. Belonging, purpose, storytelling and transcendence: these are the four pillars of meaning, and they are accessible to everyone, regardless of religious beliefs, cultural backgrounds or economic status. As someone who has made a living as a professional writer and author, I was particularly struck by the storytelling section. Though it was not surprising to me that story plays a critical role in finding fulfillment in life, it was fascinating to learn the many reasons why (both for the storytellers themselves, as well as for listeners or imbibers of those stories). The author turned to several novels to help illustrate her points – from MIDDLEMARCH and THE LITTLE PRINCE to LIFE OF PI and THE DEATH OF IVAN ILYCH – as well as numerous memoirs. I especially liked this point: “We are all the authors of our own stories and can choose to change the way we are telling them. One of the greatest contributions of psychology and psychotherapy research is the idea that we can edit, revise and interpret the stories we tell about our lives even as we are constrained by the facts.” And how we perceive our lives and stories is directly related to whether we ultimately find fulfillment in them. The sections on belonging, purpose and transcendence are equally fascinating. They are packed with examples of how seeking and finding fulfillment leads to better physical and mental health, helps us overcome traumatic events, and guides us to lasting contentment rather than fleeting happiness. 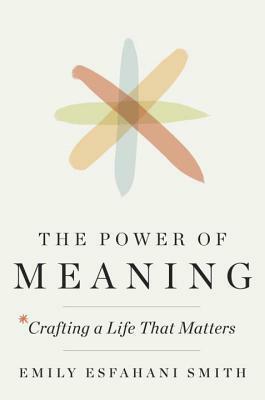 For my 4th book overall (and first non-fiction selection) I read The Power of Meaning: Crafting a Life that Matters. I normally steer clear of anything that smacks of self help and especially arbitrary treatment of really challenging concepts like happiness and meaning. But I heard some bits about this book on one of my (too many) podcasts and a major theme stuck with me: the difference between happiness and meaning, and how they can sometimes even conflict with each other, at least in the short For my 4th book overall (and first non-fiction selection) I read The Power of Meaning: Crafting a Life that Matters. I normally steer clear of anything that smacks of self help and especially arbitrary treatment of really challenging concepts like happiness and meaning. But I heard some bits about this book on one of my (too many) podcasts and a major theme stuck with me: the difference between happiness and meaning, and how they can sometimes even conflict with each other, at least in the short term. It also felt like a good time to think through these things since I'm at a bit point in my life where I'm able to think broadly about what to do longer term - or what I want to be when I grow up in general. Overall, I really enjoyed the issues raised here and the writing. It doesn't exactly conclude with a formula "do this and find meaning" but to me that is a good thing. This is not a topic that a simple formula can address. I will be thinking about some of the major concepts as I decide what I want to be doing going forward, and will try to keep it in how I treat others and make sure I'm active in communities that matter to me. I had a few strikes because while Esfahani Smith doesn't exactly say that she thinks religion is required for meaning, she does seem to dig up examples that are very traditional religion based, which detracts from how generally applicable it could have been. I think that exploring the concept of meaning is extremely important for those of us who don't and never will believe in god, and when an author implies that a solution is to just get faith it is pretty obnoxious. But, I would say 90% of the content could still be applied so a fairly minor ding in my book. Definitely would recommend. Oh and I'm reviewing this from Mexico City, feel even more sorry for me. One of the many things I love about travel is that you can just crush books on long bus rides or while waiting for one mode of transport or another. I plan to knock out at least one more this trip. Emily Esfahani Smith is a journalist and the author of The Power of Meaning: Finding Fulfillment in a World Obsessed With Happiness (Crown). In this book, Smith argues that the unending pursuit of happiness has distracted us from what really matters—the search for meaning in life. Smith draws on psychology, philosophy and literature—as well as her own reporting—to write about the human experience. Emily Esfahani Smith is a journalist and the author of The Power of Meaning: Finding Fulfillment in a World Obsessed With Happiness (Crown). In this book, Smith argues that the unending pursuit of happiness has distracted us from what really matters—the search for meaning in life. Smith draws on psychology, philosophy and literature—as well as her own reporting—to write about the human experience. Her writing has appeared in the Wall Street Journal, New York Times, The Atlantic, The New Criterion, and other publications. She is also an editor at the Stanford University's Hoover Institution, where she advises the Ben Franklin Circles project, a collaboration with the 92nd Street Y and Citizen University to build civic engagement in local communities. If you're interested in joining or starting one, please reach out to Smith here. Smith was born in Zurich, Switzerland, and grew up in Montreal, Canada. She now lives in Washington DC with her husband. A graduate of Dartmouth College, she earned a master of applied positive psychology from the University of Pennsylvania.